← WIAW~This Is More Like It! 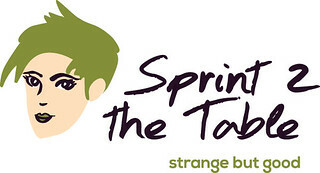 I love Strange But Good, the creation of Laura at Sprint 2 The Table. It’s great fun and lets me get some of my stranger foods out of my system. This one might not sound so strange, but for some people it might. All I can tell you is that it is Delicious! You may remember me talking about the fact that while in Florida we were attending a wonderful Weight Watchers meeting. That leader has a Facebook page. Someone from Florida posted this recipe and I found it and shared it with my friends Gail and Alice. Well, before I had the chance to get the ingredients, they had both made the soup and told me how great it was! Only problem with the recipe was that it was listed as counting for 2 Points on WW for a cup of the soup. Alice recalculated it because none of us thought this was right. It wasn’t and the recalculated count showed that it was 4 Points per cup. Regardless, it’s delicious and packed with protein. 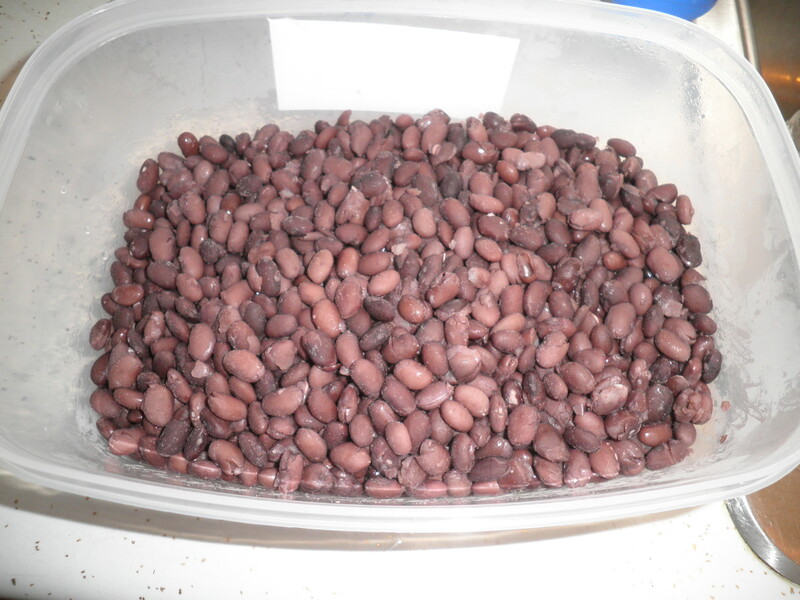 I had just made a crock pot full of black beans so I was set for them and didn’t have to use canned. All of the other necessary ingredients lined up and ready to go. Pot o’ Soup…cooking away. This is so quick and easy. Almost the most time-consuming thing is opening the cans! The finished product! This is so delicious and truly filling. This was a 2 cup serving and in truth, I couldn’t finish it. This on a night when I sat down to eat being Very hungry. This is just a great, tasty and Cheap recipe. 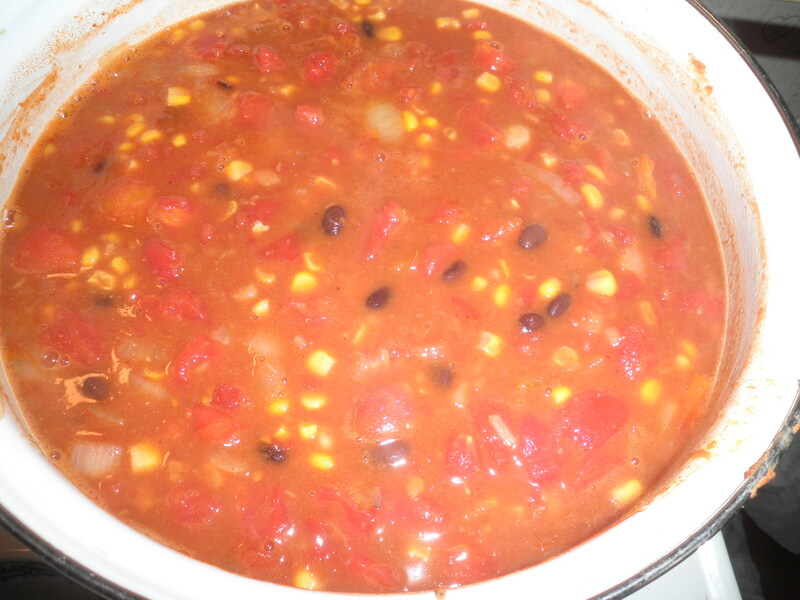 Add the other ingredients to pot and Simmer for 30 to 40 minutes. Between Gail, Alice and I we all made it just a bit differently. Alice made it with the tomatoes with jalapenos. Gail made it with tomatoes with green chiles. I made it with 2 cans of diced tomatoes because the spicy tomatoes I Thought I had were used for something else. 😦 I think it would have been tastier with one of the spicier tomato varieties, but it was just delicious the way I made it. It is absolutely something I’ll try again. The great thing is that you can have everything in your pantry and with the addition of the one fresh ingredient (the onion) you can have a hearty and tasty meal ready in no time at all. I hope you’ll all give it a try, then let me know what you think after you’ve tried it! Be sure to stop by at Sprint 2 The Table to check out the other strange offerings. Don’t forget to leave some comments! I do admit that this is not as strange as it might be, but it’s really kind of a blank canvas of a soup. Lots of things can be added and you can make it your own! 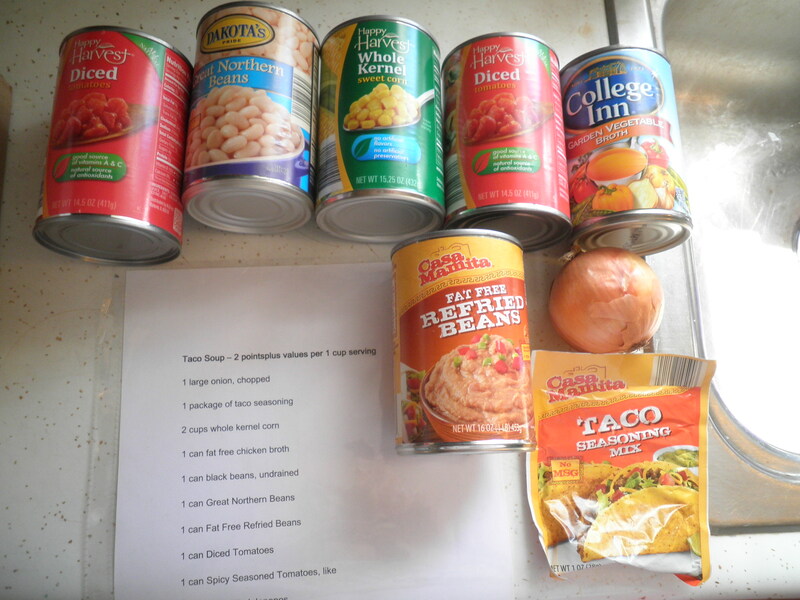 This entry was posted in Uncategorized and tagged beans, crock pot, recipe, Strange But Good, Weight Watchers. Bookmark the permalink. fran, that is fun that you, alice and gail all made the soup with a few changes…would be great to have a taste-test contest with all three variations! glad you found a recipe that is so easy, filling and tasty! have a great weekend! we have a holiday on monday so everyone will be fleeing the city today! it’s the weekend that kicks off cottag-ing! It’s really good, Cathy…you should try it!! Hope you enjoy your holiday! Ok, I have to ask…what is cottag-ing?! Ok, that makes sense now! Thanks, Cathy! Have a great weekend! 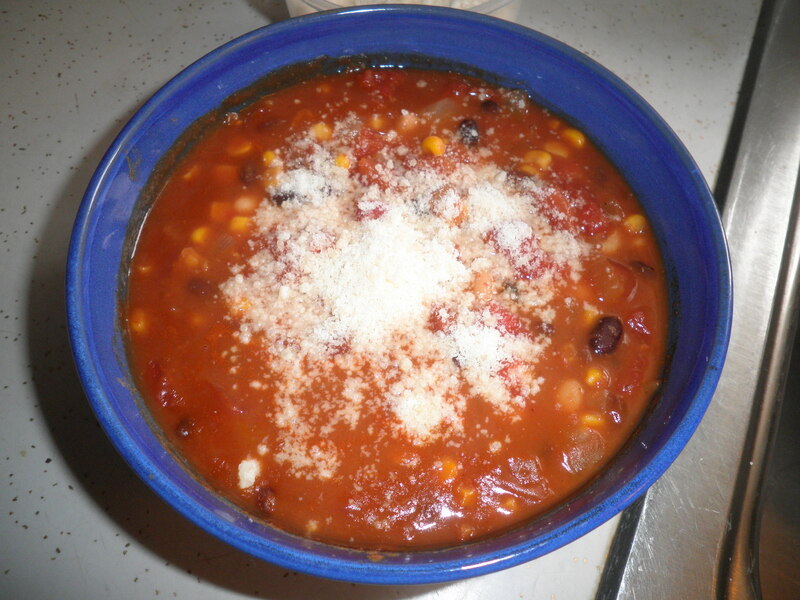 Adventurous – and great to share these ideas and soups with friends and family!! Thanks, Martie! This is going to be a staple in my house from now on!! This is such a great idea, Fran! I love the idea of using taco seasoning! This would be perfect for you, Liz! Delicious and it doesn’t make a Huge amount, although it does freeze well. You’re going to love it! I’m glad that you used veggie broth because I’m all over it now! Alyssa, I’m such a dummy and should have corrected that in the recipe. Of course, I used veggie!! 😉 It really is delicious and couldn’t be easier. Have a great day! You’ll love it, Laura! So good. It’ll be even better with the spicy tomatoes! Enjoy Blend!!! Allie, you’re going to love it. Something you can have all the ingredients in the pantry and say, “Yeah, I want to make that” and it’s ready in no time. I think it is also prime for some adaptations. Lucky for me that I gave up chips or I’d be right there in line with you! !